Stull, Kansas is where these windows reside. Their date was not to be found in any of the church’s archives. I am guessing they were fabricated by Kansas City Art Glass or Saint Louis Art Glass sometime in the thirties. Numerous repairs had been done over the years and the 1/4" leads were giving way to gravity. The windows were removed from the sash frames and were taken apart. New glass was cut to replace the broken and mismatched pieces. While still on the table they were reviewed by the building committee, signed off on and were re-leaded with restoration lead provided by DHD metals. It was determined that a wider lead was necessary, judging what had happened to the windows over the course of their history. The original sash frames were to be restored and refinished. Over the years a great deal of dry rot had occurred in the joinery in the bottom corners of the sash. Most of the structure was just missing. Cutting from the back of the sash, new wood was applied, leaving the front of the sash to reveal its’ original varnish and patina it had acquired over the years. 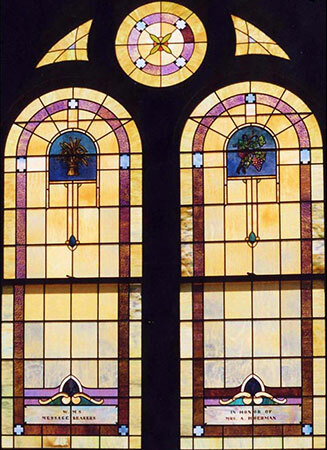 When the restoration was completed the stained glass windows looked good as new. Here is a close up view of the memorial plaque after the restoration process. 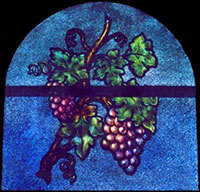 The black painted work was fired onto a piece of clear and the glass plated behind the window was Kokomo Opalescent glass # 222 X. 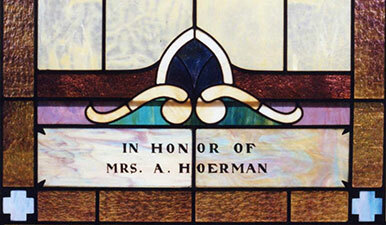 The light blue crosses in the bottom corners, were made by soldering 1/2" squares of copper filigree into the corners of the lead. The painted work on the central medallion was superb. The enamel work was truly done by a master painter. The medallion was painted on clear glass. 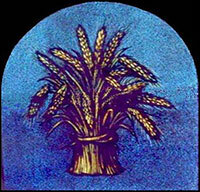 Also the painted work on the wheat sheath was true to life. The silver staining showed some metalling on the back surface, but all the paint has remained intact. The medallion was painted on clear glass.